Do you think this email is fake? I recently moved back up to Alaska in Feb. I’ve been trying to find work, but efforts have been fruitless. I am constantly on craigslist everyday looking for something that I could apply for in general. I saw an ad that said, Warehouse General Labor and replied with my resume attached, as I always do. …and something similar at the bottom of the email. The email can be read here. Notice how it says nothing about a “Warehouse Position” and is “Property Management” company who is also a ”Rental” company. Also, the link provided in the email, assuming you looked at it didn’t work. It said http://ojhmanagement.com/application/ in blue, insinuating it was a link, but down in the corner that tells you what the link is and when it was clicked takes you to http://tinyurl.com/zasrn9, which is a dead tinyurl. This was quite strange I thought. So I manually put in the link that was read from the email, since it wasn’t click-able and entered my name, email and the little keyword thingy they gave in the email. This lead me to not an application, like the email said to fill out, but a questionnaire. You know, like the kind if you were filling out an application. I thought, ‘ok, well nothing really harmful yet.’ Half way through the questionnaire was something about getting a credit report. When pressed to you to creditreport.com and also saying that I would need to print it out and bring it in with the interview. I clicked the boxes saying I completed the report and would bring it in (which I didn’t do) and finished the questionnaire. At the end it asked to upload my resume. I thought, hmmm that’s funny since I sent it with the first initial email to the ad. That’s where I stopped and made this question. Am I just being over suspicious or paranoid? Or is there really something fishy going on here? OJH Property Management can’t be found when googled and I’d like to get some jelly help. I say scam. If you’re a real company and deal with other companies you’re going to be on google. The OJH site says it’s secure but I don’t see any evidence of that. I’m also nervous about any company that doesn’t provide contact info. A blog-fine. A business? No, not fine. They should at least have a phone number. ETA- Here’s how I look at any prospective business online, especially if I’m looking for employment. If I were a customer of this company how would I contact them? If I wanted to hire a property management company, what on their site would help me? How would I contact them? Where is the customer praise? What do their currently managed properties look like? I can’t think of a legitimate reason for a potential employer to require a credit report. Sounds like a scam. Sounds a little off. Did the credit report request your social security number, birthdate and other personal information that they could use illegally? 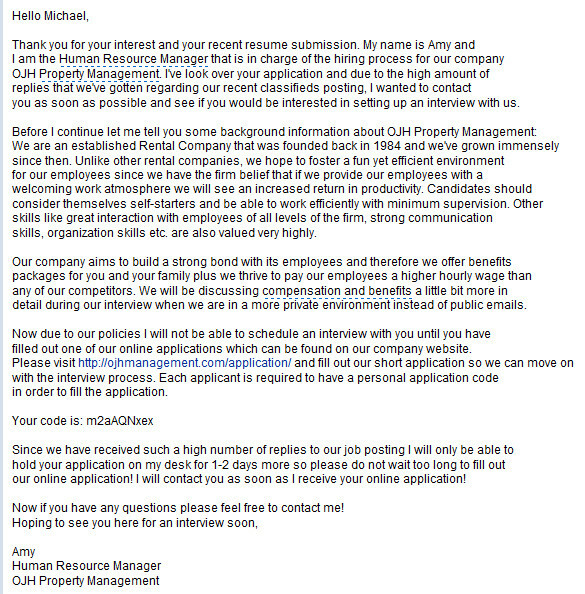 edit to add more: I re-read the email and found it interesting that the human resource person didn’t give her last name either in the first paragraph where she introduces herself nor at the end where she signs off. She just says Amy. That sure looks like a scam and the whole thing just sort of smells like one; also I’ve never tried hiring anyone where I didn’t provide full contact info for myself and the company. Checking credit is a sometimes standard practice but I’ve never heard of someone being asked to “bring it with them”. Also googling their website brings up nothing (no site, no trade mentions, no ads, nothing, well I did find this), being in business since 1984… that seems odd too. If you want you can always ask them for their EIN, I don’t know if every company has one, but all the ones I’ve worked with do or are in the process of getting one. A company around that long should have one. @chyna the credit report seemed legit, but the OJH “company” said this company does it for us and I saw under the credit report options, How were you referred? & didn’t see anything about a job application or anything close. And, “Amy” says to feel free to contact her, but I don’t see a phone number. No last name and no phone number seems, at the very least, unprofessional and possibly a scam. Also, @chyna the email was a @hotmail.com is the email, which leads me to believe that it’s not from a company. Yeah, probably best to pass this one up. I’m unemployed at this moment too, so I wish you much luck in finding a job. This is most certainly fake. I live in Maine and received the same e-mail after responding to a Craigslist ad. I didn’t even open the link because one of the dead giveaways is “I’ve look over your application” which sounds like someone who doesn’t speak English well would say. They don’t give any contact information. Also, I don’t know anywhere on this planet that says they cna onlhy keep your application for a couple days and urge you to act asap. The e-mail mine came from was Kyle Bryan <ravebavopi63@hotmail.com> which does not look like a real address. Unfortunately Axe, this is the second time using craigslist that I’ve come across some “scammy” postings. So I guess all I can say is good luck on the rest of your job-hunts bro… and keep your eyes sharp! welcome to fluther you two. Why are any emails from my company automatically being marked as spam? How long has this "internet money laundering" scam been going on?